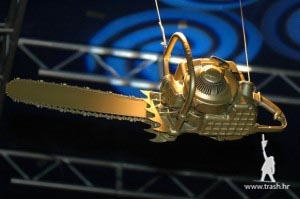 Award of the Trash Film Festival is called Golden Chainsaw. The contestants for this prestigious trash award can be amateurs as well as professionals. A chainsaw is a useful tool and above all powerful and atractive gear which symbolizes penetrating, devastating, but controlled male energy. It is a compound of engineer beauty that celebrates ?man-the-ruler” and industrial ugliness that kills the nature. It is a compound of a rational mind who seeks for the optimum between power and loss, and insane irrational mind who kills for fun in a most cruel way. 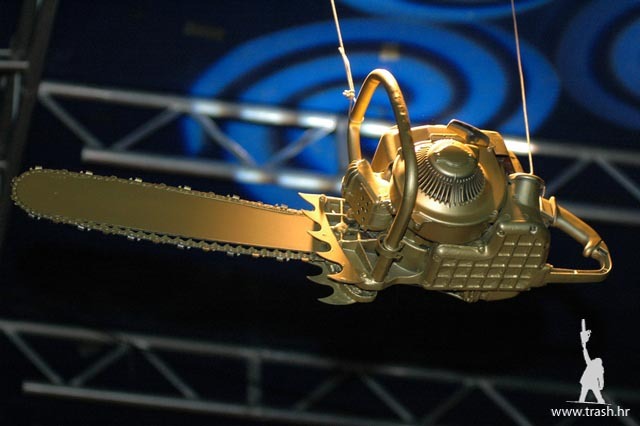 A chainsaw is an extension of a human body. A part of biomechanical world in which humans and robots are both partners. Future that is already here and that is threating us, because with a chainsaw in a hand, man becomes a buldozer as well as a Terminator. It is a symbol of a diabolic technological progress- a blessing for a woodmen, but also for a serial killers. A Chainsaw is the only two-stroke combustion engine humans will ever hold. A monster from the garage, with a miniature caterpillar track, it suffers thousands of explosions a minute inside its belly. Phallically, but ergonomically shaped, a cross between sword and a motorcycle, it is the only weapon both cold and fiery. Cold in the way we use it, firearm by the principle it works. That’s why a chainsaw joins the past and the present, control and helplessness. A chainsaw is the fire of Prometheus which we reluctantly carry; it is the good servant and a bad master. Chainsaw is a hard-working man’s tool. It enables the worker to cut down a large number of trees per time unit. The Chainsaw is usualy owned by the society’s elite. It is constantly holding down the growth and development of the forest, so development could be reserved for the elite. The Chainsaw will work with no mercy untill the nature strikes back with erosion, ouragans and tsunamies. The Chainsaw will turn against it’s master in a fantastic explosion which will wipe all the world’s trash and bring us back to the point zero. To the point of primary Trash!